This week's Clean and Simple challenge on Splitcoast is using designer paper and I decided to combine it with a past Fall to Layout from the Clean & Simple blog, which works perfectly with multiple dsp patterns. I pulled out my Sweet Pea Designer Series Paper Stack and paged through the sheets (there are A LOT to choose from) and picked three patterns that I really liked together. The card pretty much made itself from there! I've had a stash of Jumbo Grommets sitting in my embellishment drawer for some time, so I was happy to put one to use on this card. The sentiment comes from the Trendy Trees set, which I stamped in Chocolate Chip ink and added a little paper-piercing for good measure. Thanks for stopping by! I love this card--very pretty!! 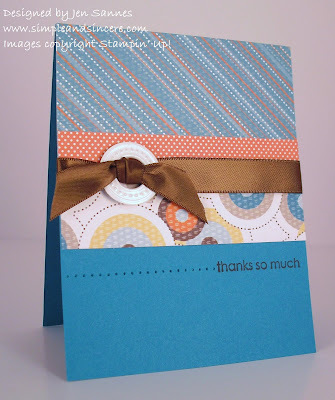 How did you do the grommet--is it going through the ribbon and cardstock? I had some grommet trouble - I had planned to put it through the cs and ribbon, but it would go through. So, I folder back the prongs on the grommet, tied the ribbon through it and added a little adhesive to the back of the grommet, just to make sure it would fall off! LOL! I evidently need more grommet practice. Whoops, forgot to leave my blog!